I am enjoying the wonderful Florida sunshine on a business trip and stopped in to visit my folks. I NEVER know what to buy my mom – she buys everything herself! Sound familier? 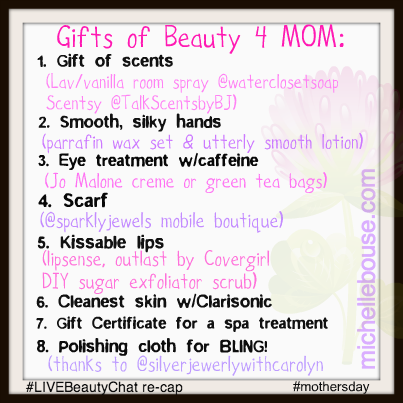 I just finished a Live Beauty Chat with my mom on my Facebook Page.. Here’s the cheat sheet of gift ideas & the sampling of Mom’s gifts this year. Along with some of the boutiques I will visit online at Facebook to purchase. Hope this helps you find the perfect gift for Mom this year! Confession: I still have to order my gifts for mom. Think they will be late. Oops! Sorry Mom.